Brazil's former President Luiz Inacio Lula da Silva attends his swearing-in ceremony as the chief of staff to President Dilma Rousseff, at the Planalto presidential palace, in Brasilia, Brazil, Thursday, March 17, 2016. A federal judge in Brazil has moved to block the appointment of former President Luiz Inacio Lula da Silva as his successor's chief of staff, hours after he was sworn in Thursday. Critics have called Silva's appointment a bold-faced attempt to help him avoid possible detention in a sprawling investigation into corruption at the state-run Petrobras oil company, as Cabinet members cannot face criminal charges unless they are approved by the Supreme Court. President Dilma Rousseff has insisted that Lula would help put the troubled country back on track while denouncing attempts to oust her. 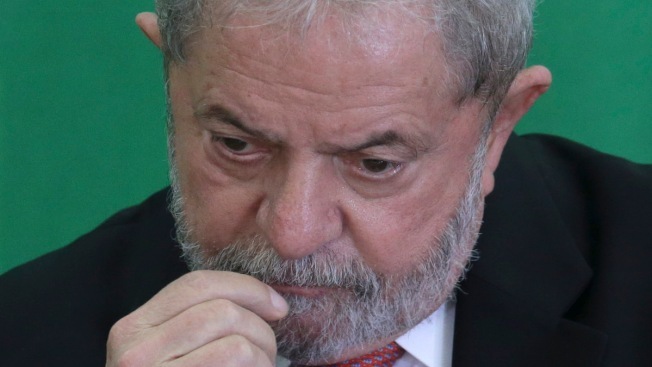 Federal Judge Itagiba Catta Preta Neto swiftly issued an injunction to preliminarily suspend Lula's appointment on the grounds that it prevented the "free exercise of the Judiciary Power, the operation of the Federal Police and of the Federal Prosecutor's Office." The probe already has ensnared dozens of public figures from across the political spectrum as well as prominent business leaders. It's just one of several crises battering the nation that in five month will play host to the Olympics, including a deepening recession and an outbreak of the Zika virus. Anger over Silva's appointment fueled protests Thursday in Sao Paulo, where demonstrators brandishing inflatable dolls of Silva in black-and-white prison stripes shut down the main thoroughfare in the metropolitan area of 18 million. In the capital, Brasilia, three demonstrators were detained during scuffles with government supporters. At the swearing-in ceremony, the atmosphere recalled a campaign rally as a crowd packed with top officials broke into pro-government chants. In a combative speech, Rousseff said she was counting on her "great friend, great comrade" Silva to help lift the country out of the current economic and political imbroglios and vowed that "the shouts of the putschists are not going to take me off course nor will they bring out people to their knees." The president, whose approval ratings have touched single digits in recent months, is battling an attempt in Congress to impeach her and calls from protesters in the streets for her ouster. Rousseff lashed out at Wednesday's surprise release of tapped phone calls between Silva and a host of prominent public figures, including Rousseff herself. The judge heading the Petrobras case, Sergio Moro, released the recordings hours after the announcement of Silva's appointment, writing that the taps appeared to suggest attempts to influence judicial officials in Silva's favor. Rousseff called the recordings illegal and said their release made "clear the attempt to overstep the limits of the democratic state." Silva's appointment comes under two weeks after officers took him to a police station to respond to questions in the Petrobras scandal, and critics see his return to the government as a way to help avoid legal woes. Government supporters, on the other hand, insist Silva will be crucial to blocking what they see as politically inspired impeachment proceedings against Rousseff over allegations of fiscal mismanagement. Both Rousseff and da Silva have repeatedly denied any wrongdoing. Rousseff has seen her popularity nosedive as the country of 200 million has spiraled into crises on several fronts. The Petrobras corruption investigation has stained Brazil's political and business elite. The country is ground zero for the Zika virus, which scientists believe can lead to birth defects. The economy is mired in the worst recession since the 1930s, with rising inflation and daily announcements of layoffs adding to people's fears and desperation. And in the middle of it all, Brazil is set to host the Summer Olympics in Rio de Janeiro in August. On Sunday, an estimated 3 million people took to the streets for nationwide anti-government protests that newspapers here described as the biggest political demonstrations in Brazilian history.